A WWII bomb was “blown up” by the authorities at Clissold Park in Hackney after a civilian dug it up while he was gardening in his own property. 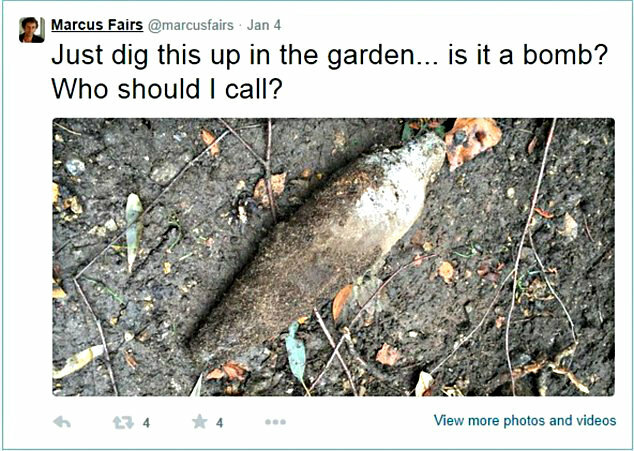 47-year-old Marcus Fairs was planting a bamboo screen at the back of his house when he came across the unexploded WWII mortar. According to him, he had dug up several bricks prior to finding the bomb as that part of his property had been an air raid shelter during the war. After his discovery, he took a picture of the unexploded WWII bomb and posted it on Twitter asking what to do with it. When someone replied saying that he ought to call the police, he finished the work he started in his garden before doing so as he anticipated being evacuated due to his unusual find. Mr. Fairs went on to say that the police came promptly, just about five minutes after he called. When the bomb squad came, they were the ones who brought the unexploded ordnance out of his property and told them it would be brought to Clissold Park for controlled detonation. The Clissold Park was immediately evacuated before the controlled detonation took place. The 70-year-old explosive device was, then, covered up with white water bags to suppress the explosion its blast would cause and prevent flying shrapnel. Police authorities used the social media site Twitter to explain the steps they took in safely detonating the said vintage bomb and as to why they had to bring it to Clissold Park for detonation. On the other hand, residents living near the area also took to the said site their reactions and speculations about the explosion the bomb detonated at Clissold Park, Hackney, caused. As for Mr. Fairs, he admitted that finding the bomb was really exciting for him though he never thought it would go on such a great blast when the bomb experts had it “blown up” at Clissold Park. According to him, a friend had told him that the bomb looked like a British mortar and was believed to have been brought back by a serviceman after the war and kept inside the air raid shelter as a memento.